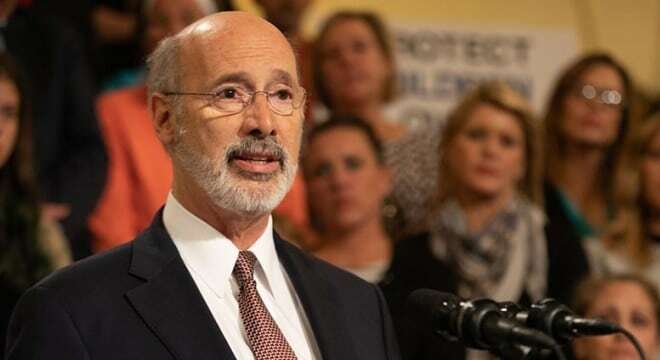 Pennsylvania’s Democratic governor pledged this week to sign a pending state law increasing the mandatory surrender of guns in some domestic situations. The measure that Gov. Tom Wolf is backing, HB 2060, was approved 131-62 by the Pennsylvania House last week and 43-5 by the Senate on Wednesday. The aim of the proposal is to pump up the existing surrender gun policy of convicted abusers in the Commonwealth and the Democrat vowed to sign it as soon as it hits his desk. The bill would make those subject to a misdemeanor domestic violence conviction or a final Protection From Abuse order relinquish their guns and ammunition to police or a gun shop within 24 hours of a hearing. Current law, which allows more judicial discretion on ordering surrenders, grants a 60-day window and the ability for those subject to such surrender orders to give their arms to a third-party, such as a friend or family member, to hold. An amendment by state Sen. John Eichelberger, R-Blair Township, to continue to allow friends to hold guns was defeated 39-9. Those who don’t comply face two years in prison and a fine of as much as $5,000. Second Amendment groups argue that spurious orders have in the past been filed vindictively and that gun owners can easily lose their firearms and right to keep and bear arms pending lengthy legal appeals and, even if they get their guns back, could leave them on the hoof for thousands in storage fees. Further, they point out that police could sell guns stored with them after a year as surplus property and keep the money. National and local anti-gun groups have stumped hard for the effort, holding a myriad of press conferences, buying billboard ads, flooding the halls of the Statehouse with activists on the eve of votes on the legislation, and driving calls and digital messages to lawmakers urging them to back HB 2060. As for Wolf– running a race for a second term in which polls put him ahead of his Republican challenger, Scott Wagner, by double-digit numbers– he has promised to work for more gun control in the future. “There is more work to be done, and I look forward to working with the House and Senate to enact additional commonsense reforms to reduce violence, support victims and keep guns out of the hands of dangerous individuals,” he said Wednesday.